Please be aware Pro-Force Limited will be conducting all our recruitment directly in Ukraine and Moldova. We do not work with third party companies. If you are asked to pay money to be part of this scheme by an individual or company, please do not make any payment. Pro-Force Limited will only contact you via our website or authorised social media pages and email accounts. The only costs to our staff will be for their own transport, their VISA and insurance. We are pleased to have been selected by Government to implement the new Seasonal Worker pilot operated by the Home Office. Our selection is testament to the strength and depth of our teams supported by extensive systems and processes designed to improve efficiencies and protect our workforce. We are seen as the leaders in ethical recruitment, being the first large recruiter to bring all recruitment inhouse and ensure worker fees were abolished from our supply chains. The business has been instrumental in developing guidance for the industry including Retailers, The Fresh Produce Consortium and The Association of Labour Providers. We are well placed to administer and deliver a successful pilot. The models we have proposed will ensure industry success whilst reducing risk and delivering timely reporting data to the stakeholders. Our models will help drive efficiencies in the sector and will leave the government with a successful potential future scheme. The adaption of our own Operations Management software (TOM), we believe will set us apart, with end to end visibility for candidate, grower and Home Office. National Recruitment specialist Pro-Force has been selected to pilot an innovative new Seasonal Workers Pilot (SWP) for Government, as part of plans to ensure the UK has enough labour to harvest the £1.5 billion worth of fruit and vegetables it grows each year. Chief executive Matt Jarrett said Pro-Force’s selection as one of two operators running the two-year pilot is testament to its efforts within the recruitment industry to work on improvements that protect workers from the dangers of modern day slavery and other labour abuses. He said: “Between 70,000 and 80,000 seasonal workers are needed in the UK each year according to the National Farmers Union, and some 13% of these positions went unfilled last year. Rising incomes within the EU, unfavourable exchange rates and recent uncertainty over the future have combined to make the UK a far less attractive destination for unskilled workers. This has had a direct impact on our fresh produce growers, impairing their ability pick produce and remain competitive in the international market. 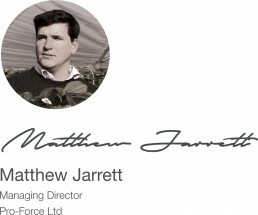 Mr Jarrett explained that the Pro-Force proposals, accepted by the Defra and Home Office, had to clearly demonstrate how workers would be protected, migration managed and efficiencies maximised. Ethical standards were a major part of the application, focusing particularly on quality of accommodation and processes so that any concerns from workers could be easily raised and quickly addressed. “It has been a very thorough selection process, but these are strong areas for us,” he added. “Over recent years we’ve been actively involved in developing new industry standards, working closely with the major retailers, the Fresh Produce Consortium, and The Association of Labour Providers. The development was also welcomed by the UK’s Association of Labour Providers (ALP), with chief executive David Camp saying he was pleased to see the progress made so far with the Seasonal Workers Pilot. “Our labour supply surveys contributed to the overwhelming evidence data for the need to access new labour markets and the ALP made a strong case for a model seasonal workers scheme that was best delivered by labour providers and which protected the interests of the workers, said Mr Camp.